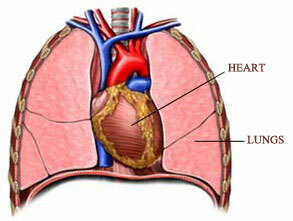 Lung is the human lungs are the organs of respiration in humans. Humans have two lungs , with the left being divided into two lobes and the right into three lobes. Together, the lungs contain approximately the same length as 1500 miles (2,400 km having a total surface area of about 70 m2 in adults � roughly the same area as one side of a tennis court. Furthermore, if all of the capillaries that surround the alveoli were unwound and laid end to end, they would extend for about 620 miles. Typical resting adult respiratory rates are 10�20 breaths per minute with 1/3 of the breath time in inhalation. Human lung are situated to both side of the heart.in body they are both side of the chest from neck to upper part of the abdomen. 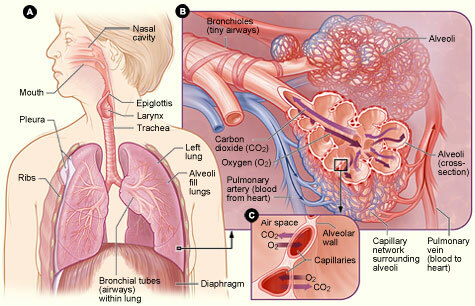 Lung carries oxygen from the environment to the deoxygenated blood. It replaces CO2 of blood by O2..this O2 is reached to all parts of the body through blood. In such a manner blood is purified by lung. 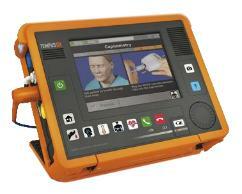 By spirometry: it measures the capacity of the lung in the form of volume of air inhaled, exhaled and other. By this many lung diseases can be identified.